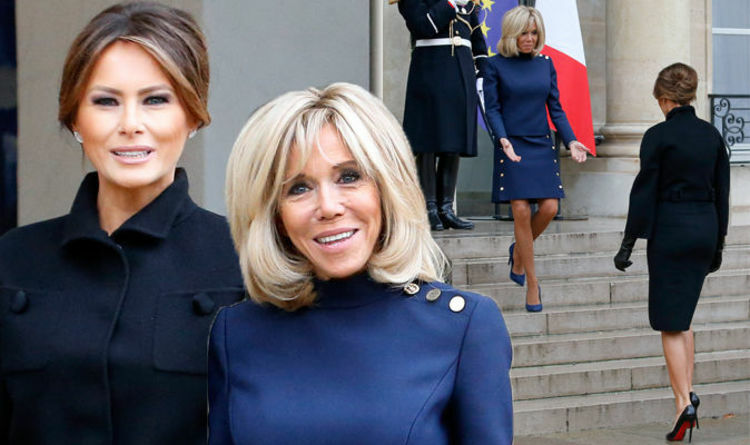 Melania Trump, 48, and Brigitte Marcon, 65, were pictured greeting each other at the Elysee Palace in Paris today prior to a lunch with their husbands President Donald Trump, 72, and President Emmanuel Macron, 40. Both ladies, despite the drop in temperature in the French capital, opted for bare legs with their outfits. The US First Lady wore a black coat dress fastened up to the collar and cinched in at the waist with a belt. It featured two pockets on the breasts, with one large button on each, and a small slit up the front of the skirt. To help keep warm on this November day, Melania also wore a pair of black leather gloves, and teamed the coat dress with a pair of stilettos heels by her favourite French designer Christian Louboutin. The US president’s wife glamourised the look further with a neat up hairdo and some delicate diamond stud earrings. In a similar shape getup, Brigitte was photographed wearing a dark blue matching skirt and top. The top was long sleeved and the seams on the front and structured shoulders accentuated the former teacher’s petite frame. It also featured gold button detailing on one shoulder, and this design was continued onto the skirt, which had two rows of gold buttons, one on either side. Unlike Melania, Brigitte wore her hair down and coiffed to perfection. Melania and Donald have flown to Paris to participate in the international ceremony of the Armistice Centenary of 1918, which is taking place at the Arc de Triomphe tomorrow. Heads of State from around the world are meeting in the French city to commemorate the end of the First World War. It’s been busy in the world of US politics this week with the midterm election. President Trump had a mixed result, losing his majority in the house of representatives but strengthening his hold on the senate. So what has Melania been up to this week? Melania Trump’s spokeswoman told American news site CNN the former model wasn’t campaigning during the midterms. This is because her motherly duties made it difficult for her to campaign, as well as the time of year. One of Melania’s last appearances was when she arrived in Pittsburgh with husband Donald wearing a grey plaid coat. The Remembrance Day centenary at Arc de Triomphe will take place at 11am local time tomorrow.